Our Webcam consists of an old broken RCA camcorder which no longer functions as a normal camera but serves this purpose quite well. We hung it in the corner of the doorway outside my door. I built a security box around it with a protective plexi-glass lens guard. We have painted the box to match the wall, but this picture shows it best. ---The Camera is on all the time sending the video signal to my Power Macintosh 7600 Computer in my room. On my computer I am running a program called MacWebcamToo which is the image server and a program called Webstar which is the webserver application. ---When someone logs into my computer using a web browser they are served the page from my web browser by default because it is operating out of port 80, the default port for webservers. The html in the page then quiries the image server which is operating on port 2000 to get the current image. This is called client pull. The software doesn't save an image unless one is requested. Other similar applications automatically save an image every minute or so, but this is a waste of computing power if no one retrieves that image, this only does work when neccesary. 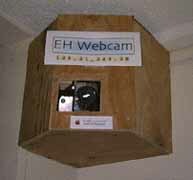 MacWebcamToo also adds the time stamp, Engineering house logo and name to the image before sending it to the webserver. ---The Server push page tries to send images at the fastest rate possible to your web browser in an effort to produce an animated view through the camera. On Ethernet I can recieve the server push at around 20k/sec which will show me a frame every 1-2 seconds according to the clock in the image. Update: Since I left the dorms for apartment life, I couldn't serve the webcam anymore. It is now served by a computer owned by Engineering House, I linked the image from that server to this page, additional info about how it is served can be found at the EH Webpage.